The Giant’s Tomb property consists of both a reserve and a conservation easement. The reserve is located at the northeastern tip of the island and the conservation easement includes a portion of the interior of the island with frontage in the wetland community in the area known as “The Gap” separating Little Giant’s Tomb in the north from the larger island to the south. Together, the two lots include an extensive area of interior forest habitat with some coastal wetland including a cobble bar that curves to the north forming a semi-circle that extends approximately 75 metres offshore. The forest community is primarily Oak Hardwood Deciduous and provides habitat for a number of interior breeding bird species. 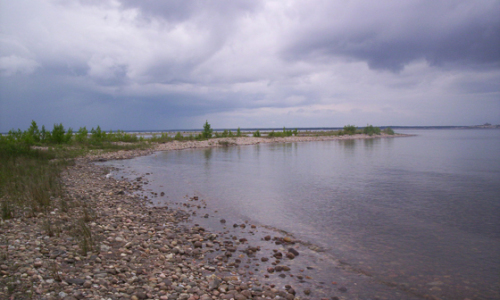 This community includes several species at the northern edge of their extent corresponding to the location of the island in the transition between southern Ontario and the Canadian Shield. Two coastal wetland communities are included. The combination of the coastal wetlands and interior forest also provide habitat for a number of reptile Species at Risk.